Reno Master Tex - gloves £55.00 - Kneepads £48.00 - Slapshot present the new 'Master Tex' range of gloves. Produced to the highest specification using all the latest materials and technologies. The gloves are made using tough aerated textile covers and long lasting palms. Master Tex have a large flexible thumb area for easier grip, added flex joints for comfort and a velcro wrist fastening. Top benefit, these gloves can be hand washed. Pictured below. 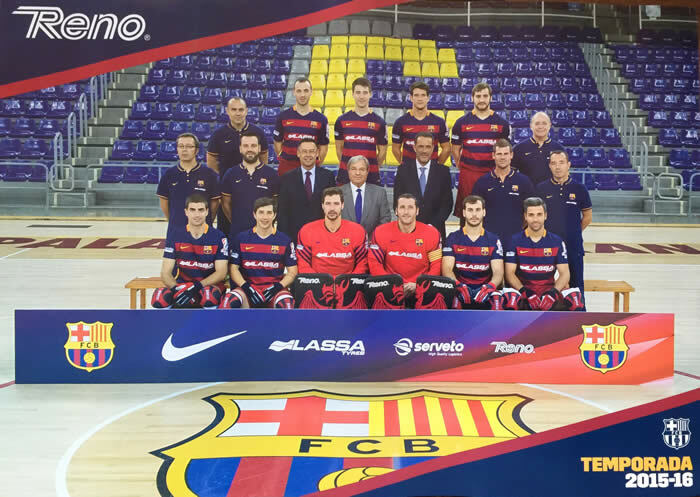 FC Barcelona, FC Porto, Barcelos, World Champions Spain, Argentina and Portugal all use Reno Master gloves and knee pads. Sizes senior, junior or youth. Colours available, blue/black/white, red/black/white, black/red, all black or pink/black/white. 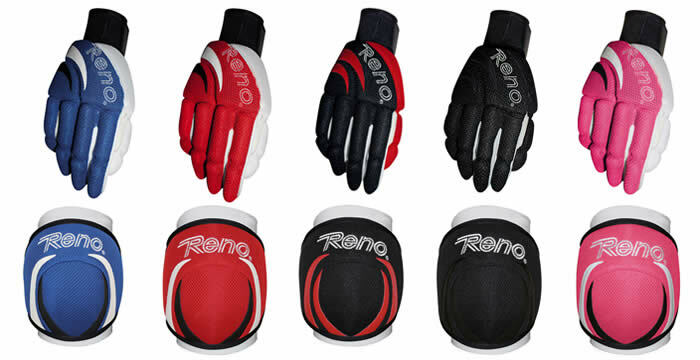 Reno Comfort Tex Gloves £55.00. Comfort Tex pictured below, have fully flexible fingers and hand back, just like the classic 'Marrioti' style glove. Made with tough aerated textile cover and long lasting palms. Top benefit are that the gloves can be hand washed! Sizes senior, junior and Youth. Comfort Tex gloves colour's, blue/ black, all black or dark/blue red. Match with Master Tex knee pads shown above. Slapshot 'Blaze' - Gloves £49.00. Kneepads £39.00. Designed by 'Slapshot' bringing you the latest styles and best protection! 'Blaze' featuring the 'Slapshot' player logo. The gloves have the strongest, lightweight internal padding available & added flex joints in the fingers and knuckles for comfort. An innovative wrist strap with Velcro fastening has been added to ensure the correct hand fit and additional wrist support. The knee pads have a compact frontal area with rigid padding giving excellent protection to both the front and side of the knee. All new colours. Carbon black, flame red/white, blue/polar white, polar white or black/polar white (not shown). 4 sizes ensuring the correct fit XL, Large, medium & Small. Slapshot 'Tecno' - Gloves £47.00. Kneepads £37.00. The latest addition to the 'Slapshot' range! All new 'Tecno' features, the glove backs & knee pads are made from breathable microfibfres to keep you extra cool! While the gloves pads are made from leather to retain stick feel. Both gloves and knee pads carry the 'Slapshot' player logo. The gloves have leather flex joints in the fingers. An innovative wrist strap with Velcro fastening has been added to ensure the correct hand fit and additional wrist support. The knee pads have a compact frontal area with rigid padding giving excellent protection to both the front and side of the knee. 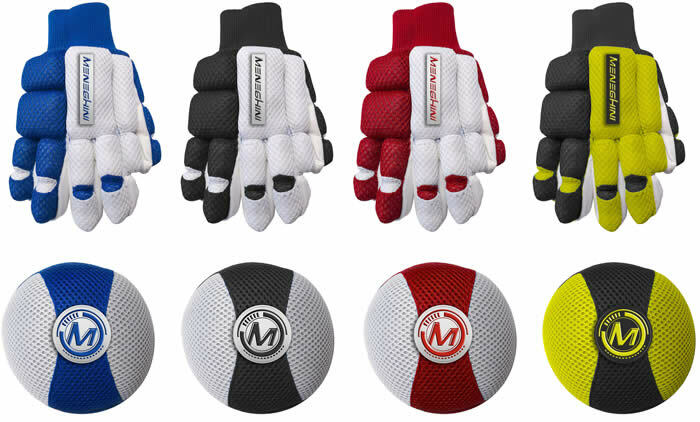 Four new colours combinations to choose from bright blue, flame red, dark black or blue/white. Extra large, large and medium sizes in stock. 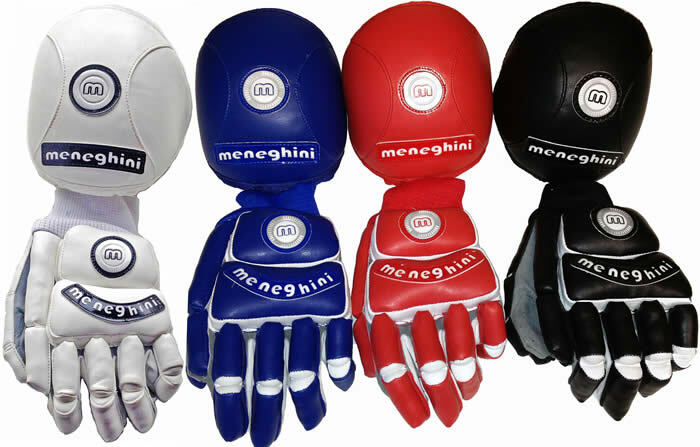 Textile tough gloves and knee pads by meneghini of Italy. 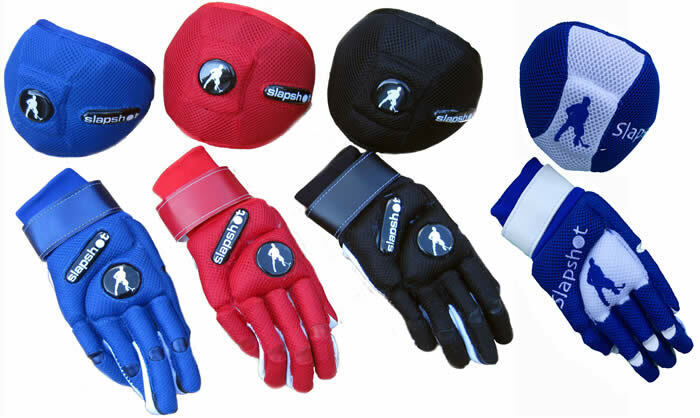 Offered by Slapshot at the special price of just £39.00 for the gloves and £39.00 the knee pads. 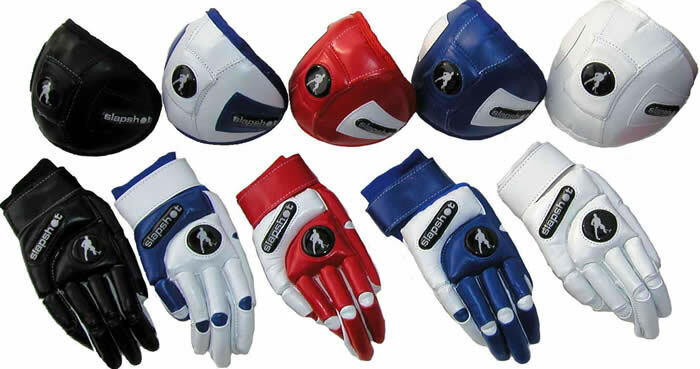 Even more Special buy the gloves and Kneepads together for just £75.00. Three colour choices, black, red or blue. Senior large size only at this price. 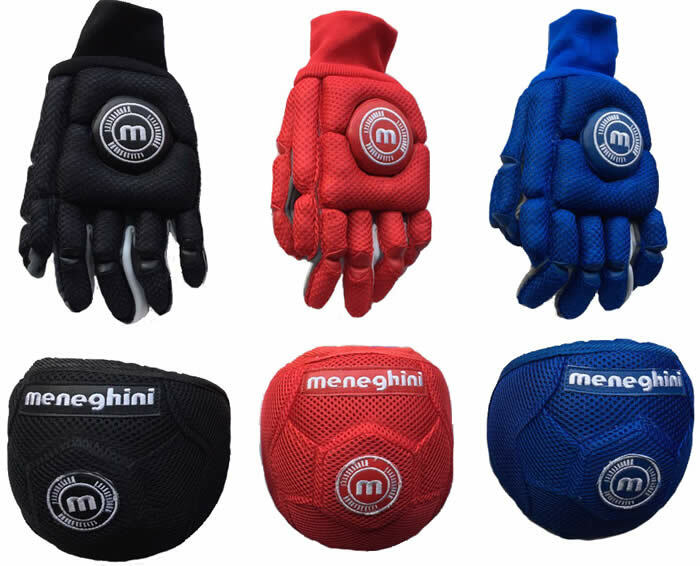 meneghini 'Spider' gloves - Special offer low price quality hockey gloves in either all black or all blue. The fingers, thumbs and glove back all have flexible joints. Aerated palm material. Limited sizes in stock. Choose from XXS or XS. 'Spider' gloves and kneepad set - The gloves have flexible fingers and longer lasting palms. 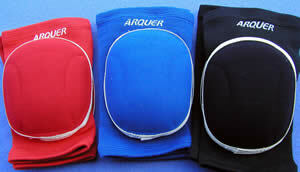 The knee pads are fastened with long lasting velcro for easy fit. 2 colours left, polar white or red/white, size XXS only. 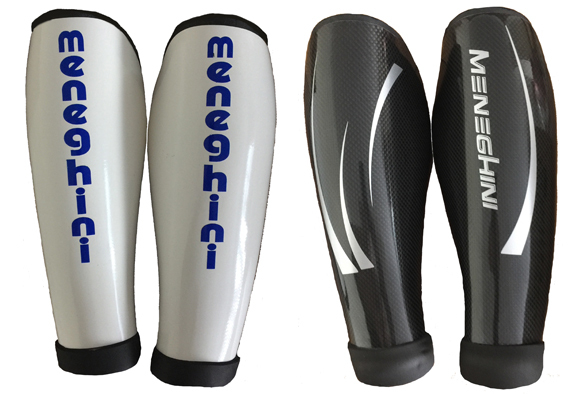 All New kits from meneghini hockey systems. Economically priced set comprising of flexi hand washable gloves, a pair of tough knee pads with velcro fastening. 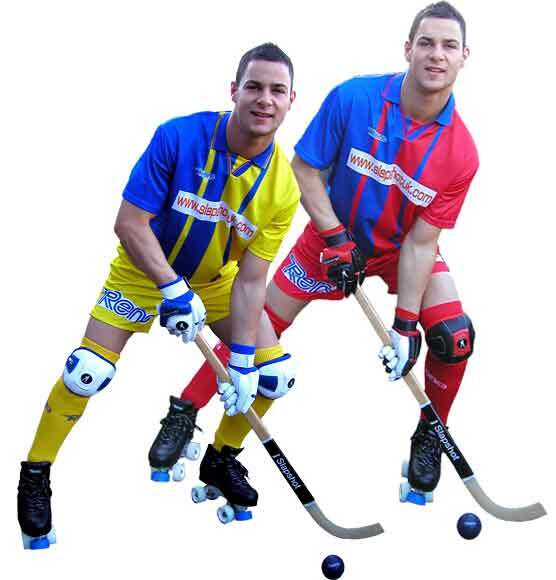 Available from Slapshot in 4 stunning colourways, blue/white, black/white, red/white and neon yellow/black. Sizes XXXS, XXS, XS, S or Medium. will fit up to 14-15 years old and most ladies. 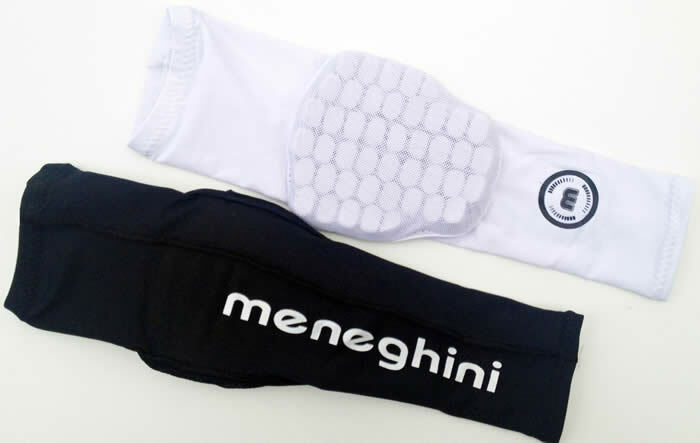 meneghini compression sleeve & elbow pad - A compression sleeve & elbow pad for the players stick arm. Can be worn as a pair. Widely used by professional hockey players to give added fore & upper arm strength with additional support. The dimpled foam padding at the elbow, gives a tough lighweight impact protection. 3 new colours to choose from, polar white, all black or royal blue (not shown). All sleeves feature the meneghini logo. Available in Large senior, Medium junior and Small sizes. New Extra Small childrens size now available. Roll Skater articulate - £49.00 - The all new matt black knee pad that allows skating without the knee pad slipping. This gives a better all round protection than conventional knee pads. The poly plastic shell and new improved velcro fastening ensure the correct fit. Sizes senior Large or youth medium. Pictured above left and centre. Queen/Skater ‘Air’ knee pads - £55.00 - The knee pads have a unique expansion system that allows the player to make all skating movements without the knee pad slipping. This gives a better all round protection than conventional knee pads. The poly plastic shell and new improved velcro fastening ensure the correct fit All black in colour. Sizes junior or youth. Pictured above right. Elbow Pads Players elbow pads afford a high degree of protection without losing the flexibility of movement. 2 colours red or blue. Available in senior and junior sizes. Slim Blue - A strong inner composite shell covered with mesh padding, makes these guards strong, but slim fit! Shown above left. Slim Carbon - Top of the class carbon guards for total shin protection. Comfortable fit for all sizes. Shown above right. Evo black - New from the Italian EVO company. 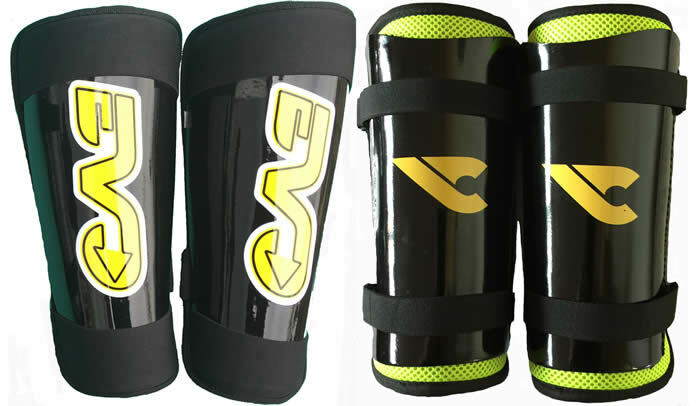 Similar look to higher priced carbon shin guards. Made from hard moulded synthetic material. Comfortably styled for a good fit. XL, L or Small sizes stocked. Pictured above left. 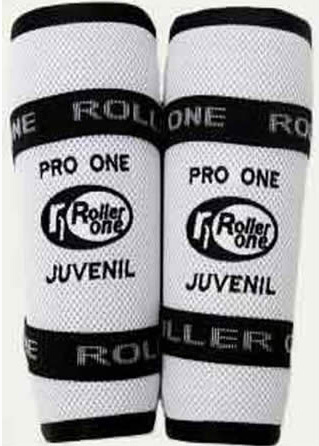 The latest style from Roller One. Slim styled guards with elastic clip fastenings to ensure an optimum fit. Very strong. Senior and Junior sizes in stock. Pictured above. meneghini Spider White - Made from coated glass fiber. Very strong and made to last. These slim style shin guards fit under the socks without the need for straps. Offering a lower cost alternative to carbon. Sizes small, medium or large. Pictured above left.